My family loves homemade Guacamole so today I am sharing this great recipe with all of you. 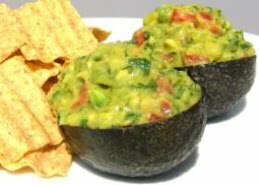 It is one of the best homemade Guacamole's that I have ever tried! The recipe makes 6 servings. Preparation: In a large bowl place the scooped avocado pulp and lime juice, toss to coat. Drain, and reserve the lime juice, after all of the avocados have been coated. Using a potato masher add the salt and mash. Then, fold in the onions, tomatoes, cilantro, and garlic. Add 1 tablespoon of the reserved lime juice. Let sit at room temperature for ½ hour and then serve.